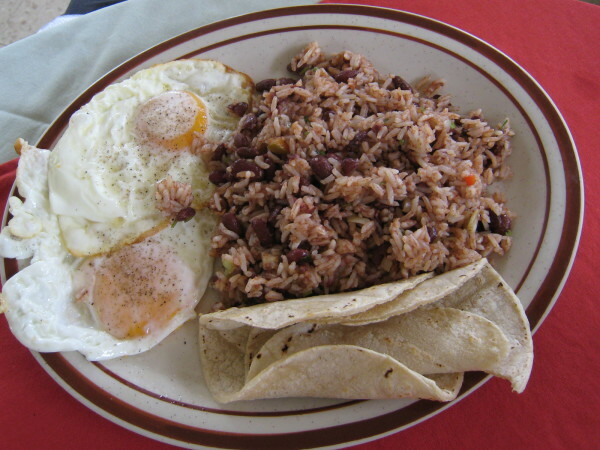 No one who’s ever visited Costa Rica is likely to forget gallo pinto, and those who haven’t visited rarely understand how people can be so enamored of rice and beans. It’s on every typical menu. Ticos look at you like you’re a little crazy if you ask how to make it; sort of like if you asked a Brit how to make a cup of tea. 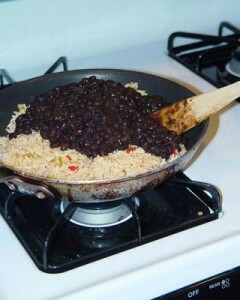 Everyone knows you just cook the beans, cook the rice, and then cook them together! It’s almost that simple, but we finally got a recipe when our friend Quincho from Heredia visited us in Colorado, and we watched over his shoulder as he cooked up a batch. 1 lb (450 gr.) Black beans. Fresh are best but most likely you’ll find them dried. 8-10 sprigs cilantro (coriander leaf) fresh or frozen, not dried! If beans are dried, cover with water and soak overnight, if they are “fresh” (still dried, but only from laying out in the sun like they do in Costa Rica), just rise them off. Drain the beans and add fresh water to an inch (2.5-cm) above the top of the beans and bring to a boil. Cover the pan and reduce heat to very low simmer until beans are soft (~3 hours). Add salt. Once the rice and beans are cooked you can refrigerate or freeze them. Make up small batches of Gallo Pinto when you want it by simply sautéing them together. Keep a significant amount of the “black water” with the beans (½-1 cup 120-240 ml). This is what gives the rice its color and some of its flavor. 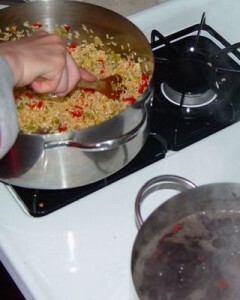 Sauté the rice, beans reserved chopped onion, sweet pepper and cilantro together in vegetable oil for a few minutes. Sprinkle with a little fresh chopped cilantro just before serving. 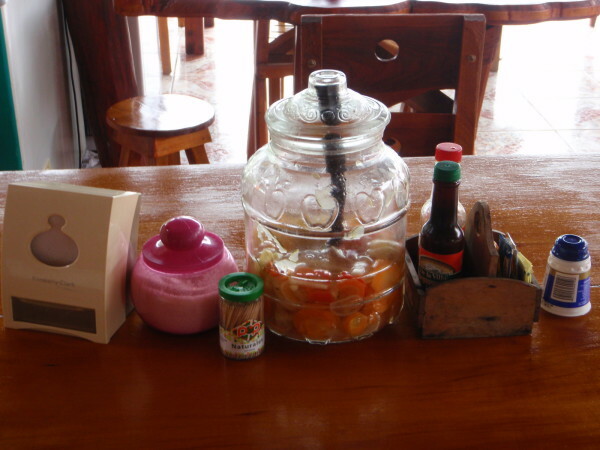 In Guanacaste they sometimes use small very hot red peppers instead of or in addition to the sweet. Some people add a tablespoon or so of salsa Lizano or Chilera to the beans while they’re cooking. Our friend Mercedes always simmered the beans very slowly all-day and preheated the water or chicken broth for the rice. 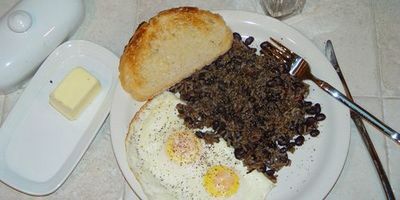 Typically served with salsa Lizano, salt, pepper, natilla and chilera.